The global trade in illegal wildlife is now estimated to be valued at $10 billion per year. TRAFFIC, the wildlife trade monitoring network, compiled a chart of the street value of animal parts, to show how demand is pushing some species to the brink of extinction. Wildlife trafficking is currently the world's fifth-largest illicit market after drugs, counterfeit products, human trafficking and oil smuggling. Rhinoceros horns can be sold for $30,000 per pound, which is more than the price of gold. 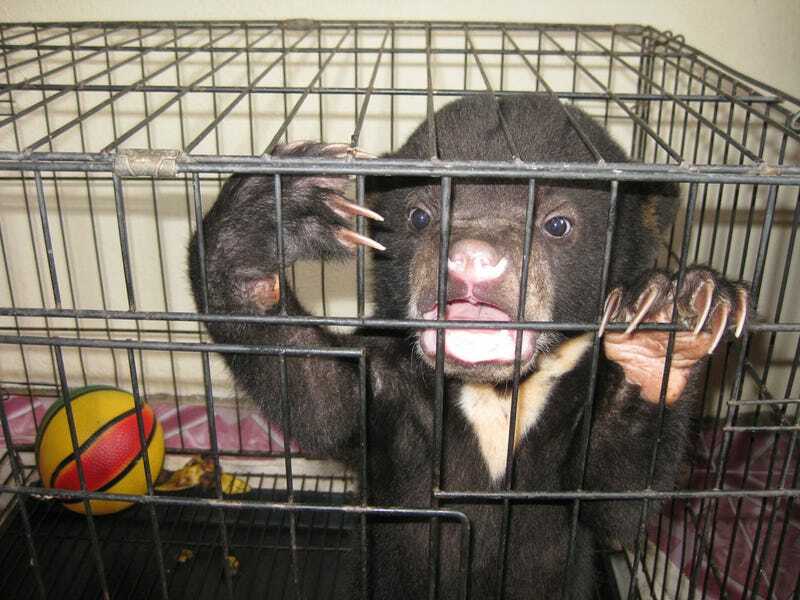 Gram for gram, bear-bile flakes or powder sell in Japan for more than cocaine in Asia…. As supply dwindles, prices rocket…Elephant ivory is valued for aesthetic reasons. Demand for rhinoceros horns, the paws and bile of Asiatic black bears and sun bears [photo above], tiger bones and penises, and deer musk, is stimulated by the healing powers ascribed to them in traditional Chinese medicine. Rhino-horn shavings boiled in water are said to cool and to cure headaches; the brew is akin to fingernail clippings in water (both are mainly keratin, an indigestible protein). Bear bile does help with gallbladder and liver problems—but no more than the synthetic version of ursodeoxycholic acid, its main component. Numerous sources indicate that organized criminal syndicates, insurgency groups, and military units are among the primary actors involved in large-scale, commercial-sized wildlife trafficking. Limited anecdotal evidence also indicates that some terrorist groups may be engaged in the wildlife smuggling trade for monetary gain. Some observers claim that the participation of such actors in wildlife trafficking can threaten the stability of countries, foster corruption, and encourage the use of violence to protect the trade. Top image: The Bornean Sun Bear Conservation Centre.